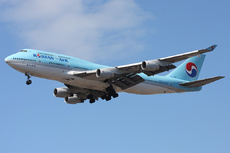 A Korean Air Boeing 747-4B5, operating flight KE1275 from Seoul-Gimpo Airport, South Korea, had landed on runway 25 at Jeju Airport when the right-hand outer engine (no.4) impacted a snow pile at the side of the runway. The snow pile was located on the crossing with runway 13/31, about 525 meters from the threshold of runway 25. The collision caused significant damage to the engine as well as dents and punctures on the right-hand wing and flaps. Improper snow removal operation at the Jeju Regional Headquarters of the Korea Airports Corporation (KEPA). Runway 25 on the right side of the runway had a snow pile of about 1.5 meters in height. 3) It is decided that the final check on the runway area of Jeju Provincial Aviation Administration before the opening of the runway 07/25 is insufficient.